Anniversary parties, birthday parties, and bachelor parties are all lividly important in shaping the foundation of a social life. They are generally simple to plan and even simpler to attend. While important these parties just don't hold a candle to the ultimate party goers dream, the political party! Nah, I am just joking you there. 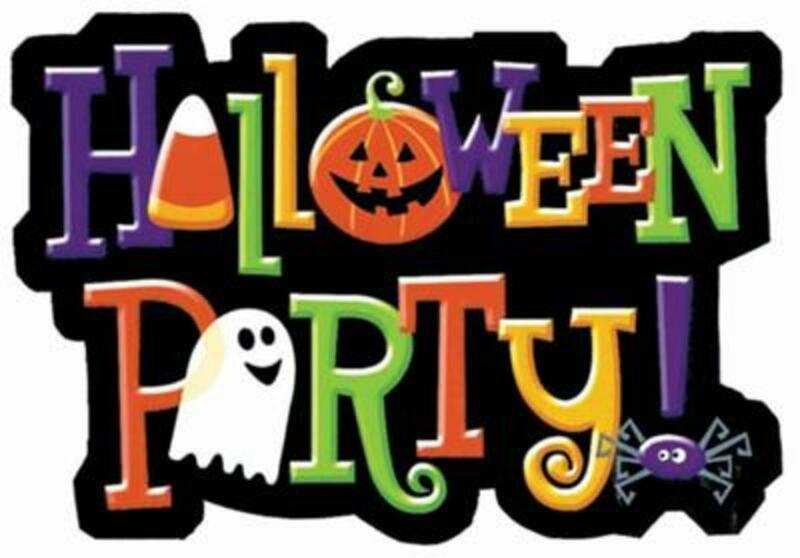 The party I am referring to is the Halloween party. To me, Halloween parties are the mecca of social excitement. Maybe to most they are really just another party but to me they are celebrations of the one holiday a year I understand the most. If done right the Halloween party can be so epic that people talk about it for the entire span of a year, anticipating your next party invite in the mail. By done right I am not talking pumpkin carving parties or the typical dress up affair, not even close. I am talking a theme party with all the fixings of a haunted house next to the road with a Bate's Motel sign hung proudly by the garage. Theme parties can be so much fun if they are done right and done well. Corpses eating fleshly delights, tattered and torn furniture stained with blood, and the shambling of good friends all make for a great Halloween get together, come to think about it they also sound like a weekend party at Tommy Lee's house. When searching for a theme I could tell my readers about my passions drifted right to the bony hand of the zombie. Zombies have remained popular for decades and with shows like Walking Dead going full force it is likely they will be just as popular for years to come. 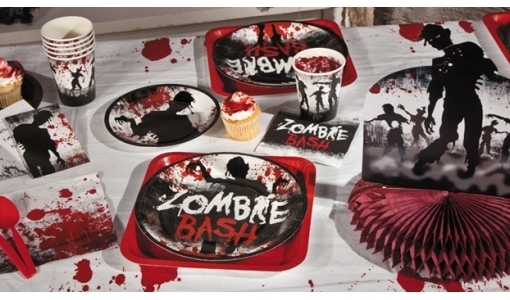 Why not create your very own zombie party? That's right boys and ghouls, a good old fashioned zombie party with all the macabre effects and timeless gore we have grown so used to. How do you do that you ask? I am glad you did, let's explore the zombie party. 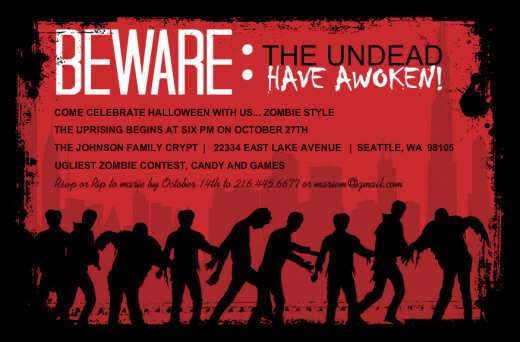 A great looking invite can drive people to a party quicker than brains will drive a zombie! Invitations for a zombie outbreak party can be just as fun to make as they are to receive. 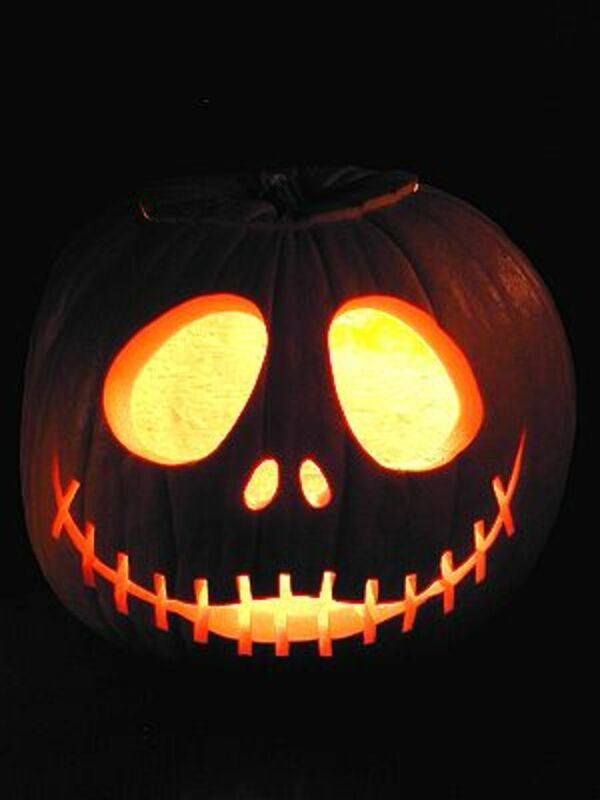 Start by getting some Halloween invitations from your favorite store. I find Dollar Store to be the most affordable. If they don't have any with zombies on them that is just fine, you will create the zombie effect yourself anyways. Adding a personal touch to invitations will give them a more inviting feel and make each person you invite feel important. Fill out the invites the way you normally would. Now rip a little bit on one of the sides of the invitation. Make it look like it was torn naturally for an added zombie affect. Now crinkle the invitation up. After you unravel it it should look like it was involved in a very rough delivery, after all in my area all mail deliveries appear to be rough ones. Now you can use fake blood, red food coloring, or even a red sharpie marker to add a little blood to your paper monstrosity. If you are using a sharpie simply lay the tip on the paper and let the ink soak through. Now get yourself a lighter or a match and singe one side of the invite. Make it look like it was in a fire at one time. Remember to make iot look battered, in a zombie apocalypse there will be plenty of blood, fire and fun. Now we have a battered and torn invite and a neat little envelope to send it in. That is unacceptable. We need to zombify that little piece of paper as well. First wad it up into a ball. Now unfold it and make yourself a cup of tea. No seriously make the tea, we need that to complete this project. After the tea bad has made the water rusty looking simply unwad that envelope and soak it in the tea for a few minutes. I talk a little more in depth about this in my article on making Halloween Jars. After a few minutes pull out the envelope and notice how it appears to have aged instantly and now has a grimy look to it. Remember the more personal the invites the more people will want to attend your zombie party. If you want you can add some blood to the envelope just like the invitation. Nope let's add another personal touch for our guest. Pick up some price tags from any store. The tags you need are the poster board ones with strings attached. If you have ever been to an antique store you have seen tons of these things hanging all over the place. If you are unable to buy the tags make your own. Now write the name of the person you are inviting on the tag and use a hole punch and some string to attach it to your finished invite and envelope. Now you have created a toe tag for your guest. I like to use these as raffle tickets for prizes but you can use them just to add some flare to a cool project. There you have it, the fool proof way to get the guest to the party. But now you have to get the house to fit the party. DEecorating a home for a zombie party is a fun task and one you can really let lose your creative side. 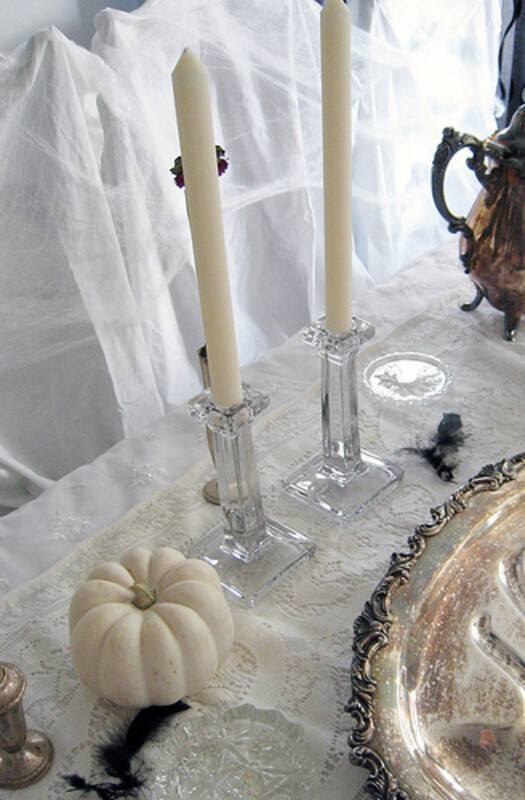 Now that we have invited our undead guest we need to make the place a little more comfortable for them. Getting a house in order for zombies can be a trying event. I suggest getting some light colored curtains and ripping them up a little. Make it look like they were shredded by claws. 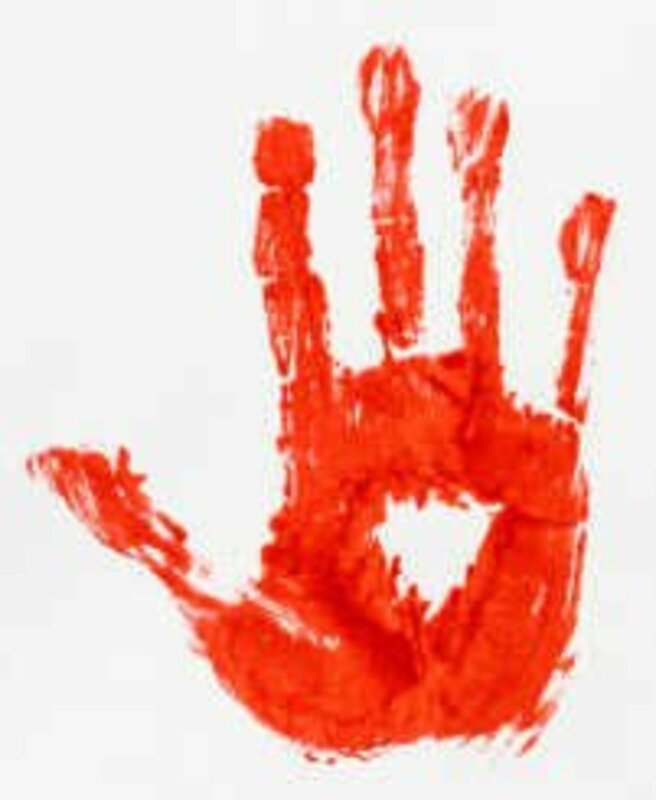 Now use food coloring, fake blood or any red paint to add hand prints to the curtains. This is great for that realistic look of a zombie outbreak. If you want to go all out you can buy red window chalk and put prints on the windows as well. This gives it that "Night of the Living Dead" atmosphere and really creates a great setting for the party. Now you may want to use tombstones to accent your decor. This is an easy task. Simply buy some foam at a craft store or Wal-mart. Now cut it to shape and spray paint it black or gray. You may even want to dry brush a little white on there to age the stones a little bit. Some people like to give the stones a humorous approach and write names like Izzy Deadstill, or Ivana Dirtnap on them. I find it more personal and interesting to place the names of your guest on the stones. 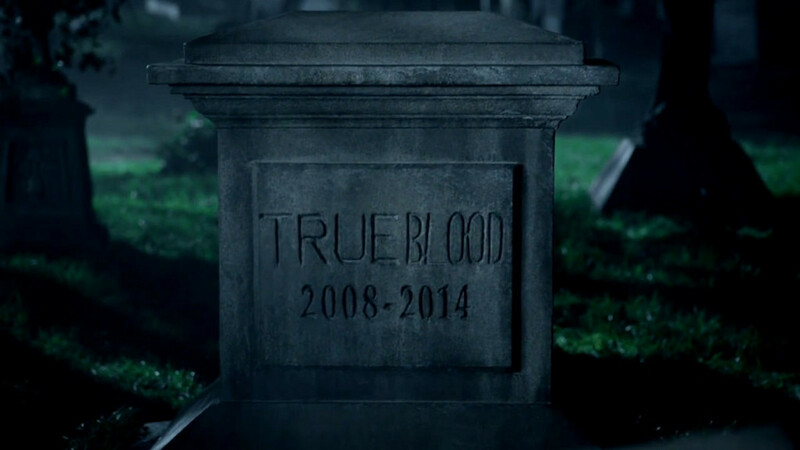 This is particularly interesting if someone does not show up and you have a grave stone of them. You would be surprised at the sheer amount of jokes that will ensue. 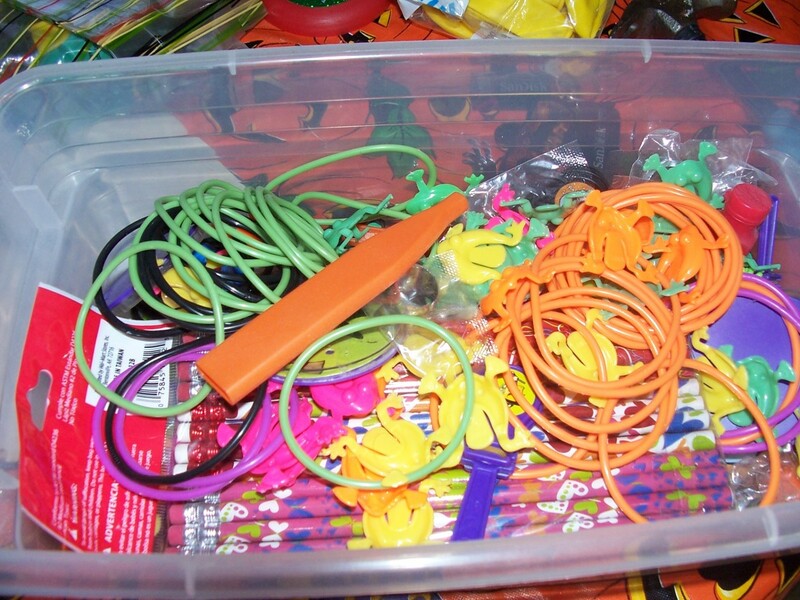 A trip to the local Dollar Tree will yield great decorations for a zombie party. Pick up some fake severed limbs like hands, arms, and feet and toss them around your party area. It will look like a zombie feasting hall. You can also find organs like livers, hearts and brains. I like to cut bite marks into the brains and leave them out like a zombie just had a nibble. You can also find a lot of really cool little prizes for your party here. Be creative with how you decorate your house. You can use a number of other decorations if you want to spend more money. Buy a few large trash cans and paint them. 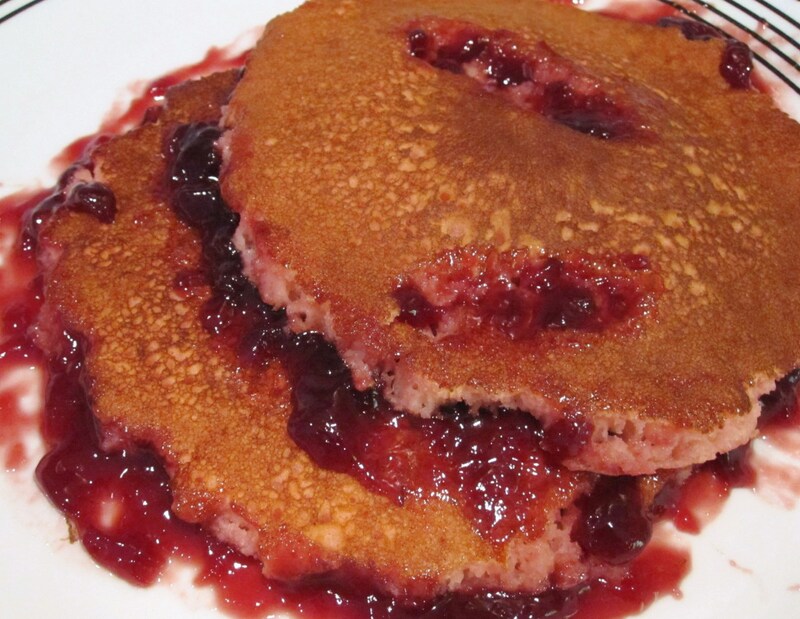 Add some foam to the top to look like chemicals spilling out. With a party like this you have such a wide variety of resources to pull from. Finding creative zombie games can be rather difficult. It is not like you can rush out and buy zombie monopoly or connect four, but why not make them yourself. Glue zombie faces to the pieces of connect four. Now you have a zombie game that will add some amusement to a game that is known to get stale and boring. In the same light look at checkers. You could glue the faces of your guest to one color and zombie faces to the other. Now checkers is a game of skill and survival. Simple fixes like this make for a great party game. I have also found people get a big kick out of pin the limb on the zombie. Just make your own pieces and go to town. I have made variants like pin the survivor to the safe house, or even the brain to the zombie. The options are endless. Be creative and come up with additional rules. Let's say you pin the survivor to a zombie instead of the safe house. Now that person has to stand with the zombies. For those intellectual zombies in the party you could play story time. Have a person start with a word and go around the room and add a word with each person. Let's say Sally says "The" and Bill follows up with "zombie". Now Bob says "is" while Ted says "sad". Now our first sentence is The zombie is sad. An easier way to do this is to use sentences instead instead of words. It can be a fun experience seeing what happens as you always seem to get a fair mix of serious zombie enthusiasts and humorous ones. 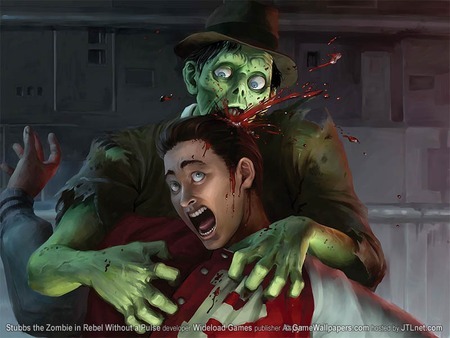 Zombie games can add fun ti the party, Just explore and find what works for you. Feeding your undead guest is a must. The key here is to remember that real brains are not gonna suffice with your living guests so reserve those for the real undead. I find that subtle treats are the best way to go about a party like this. Roll some bologna into tight rolls and put an almond on the end like a finger nail. Now you have finger sand witches that are fit for a zombie king. You can even use a little red icing to paint the almond finger nail if you want. Another really fun treat is to get cauliflower and paint it with a light coat of red food coloring. Now get some ranch dressing and do the same with the food coloring. Now you have brains with blood dip. This treat will shock and awe your guest. Although some may not be able to eat it without a little hesitation. I also like to get a gelatin mold at Wal-mart that resembles a brain and make a few jell-o brains for my guest. 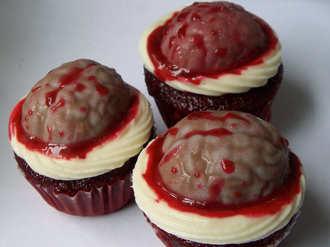 It is a sweet treat for the zombie on the run. 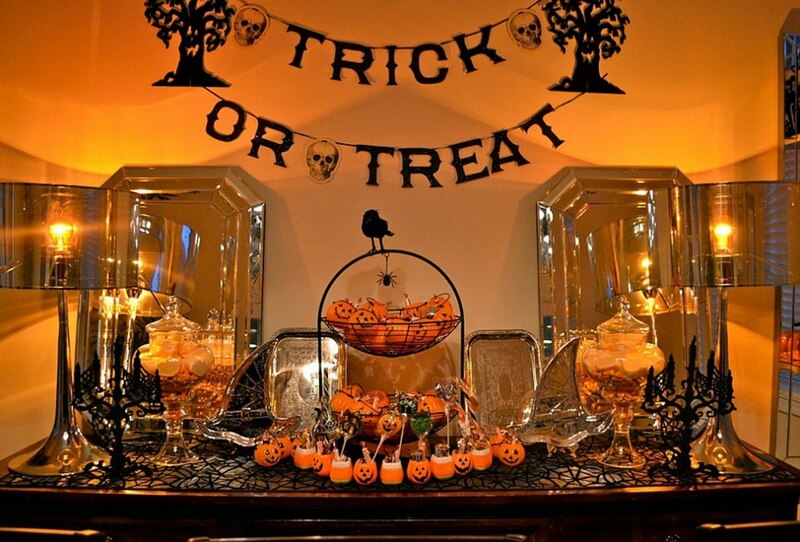 You may also want to get a few treats like hard candies and the like and just place them in blood splattered bowls throughout the house. You can make your zombie party as intricate as you want. I like to use a projector and show a zombie film on the wall. You can use zombie sounds playing in the background. It really is up to you on how far you take it. So leave me some feedback and let me know what crafty ideas you have for a zombie party.